Located along the Relgim Run, the vast Maelstrom Nebula has hampered navigators and explorers for centuries; the nebula's unpredictable electromagnetic radiation means the safe routes through the Maelstrom change every few minutes. When the Empire came into possession of an ancient Gree computer capable of calculating safe passage through the Maelstrom, however, Imperial strategists decided the nebula would be the perfect location to house high-risk prisoners. The Maelstrom Prison is a massive space station that uses both modern and ancient methods of containment. Intelligence recovered by the Republic SIS suggests some chambers were built according to specifications provided by the Emperor himself. The exact number of prisoners held is unknown, but tentative projections put the number at less than thirty; this, in turn, suggests that freeing any of the inmates would be a significant blow to the Empire. Built into a massive asteroid in a long-forgotten star system, the Foundry is an engineering marvel. 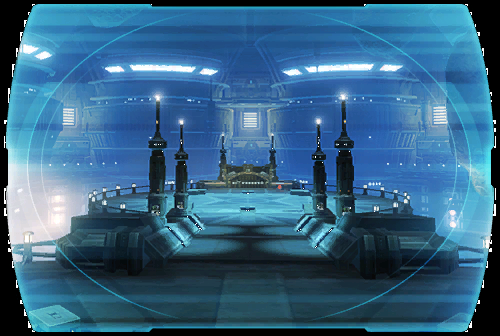 According to data obtained by Imperial Intelligence, the Foundry has at least twelve manufacturing levels capable of producing thousands of droids. Vast tunnels honeycombing the asteroid suggest automated mining droids were used to pick the interior clean of any useful ores. The Imperial Reclamation Service believes the Foundry now uses a network of tractor beams to capture and break apart nearby asteroids, providing raw materials for its endless mass production. The Foundry appears to be at least twenty to thirty thousand years old, built by a long-forgotten alien species. Its specifications resemble those of three other space stations discovered by the Empire, each possessing vast power--one, the "Star Forge," constructed fleets of warships, while another was capable of xenoforming entire planets. The extent of the Foundry's production capabilities are as yet unknown, but if history is any guide, the station could change the galaxy.